My dearest blog followers; members of the family, friends, fans and foes. "My motivation to run in this year’s SC KL Marathon is the vision of cancer-free world. Your generous donation will go a long way to help the National Cancer Society of Malaysia in achieving their objectives and goals. It will also raise awareness about cancer and making us one step closer to that world. Cancer is a word, not a sentence, so let us all do our part to help this cause." 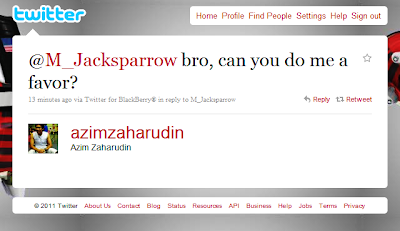 The quote above was taken from his Standard Chartered KL Marathon 2011 participant's profile. For more info, you can visit his blog HERE. 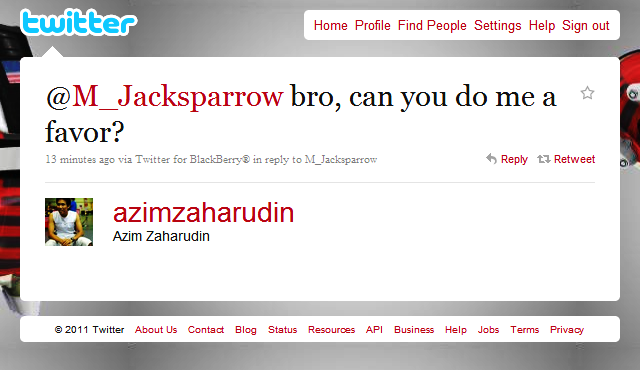 "Enough blabbering, Jacksparrow! Tell us what we can do to help!" 1) Donate to the above cause. 2) Spread the word around via Twitter, Facebook, blogs, SMS, oral conversations and other types of communication. I hope you all can help. Come on, the guy will be running 42km in distance - a distance that sounds like a suicide to many of us here. Let's SHARE this around. It's not that hard to click a button and spread this. You hardly need to move even 1 meter for this. Remember, what you do today counts tomorrow. Who knows we might be needing this one day, no? Let's help those who are in need. Let's be a caring community. I believe that all of you are good people. Godspeed, darlings!, and thank you so much. Nicely written post bro. Thank you for helping me with this cause. I definitely owe you one! The Animal Me, Justin Bieber and That Moist Lips.